A separation template samples allows you to put all the essential materials into a layout that enables conclusion of any detail required by the reader. It states the reason for parting and duration of service. It is a contractual agreement between an employer and an employee. These templates differ in color, size, and the kind of font to be used and a variety of designs and formats are available. 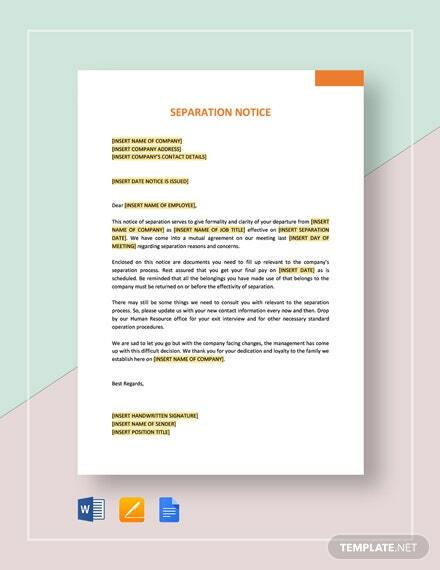 Check out the most useful separation Notice Templates that can be suitable for your business or companies. 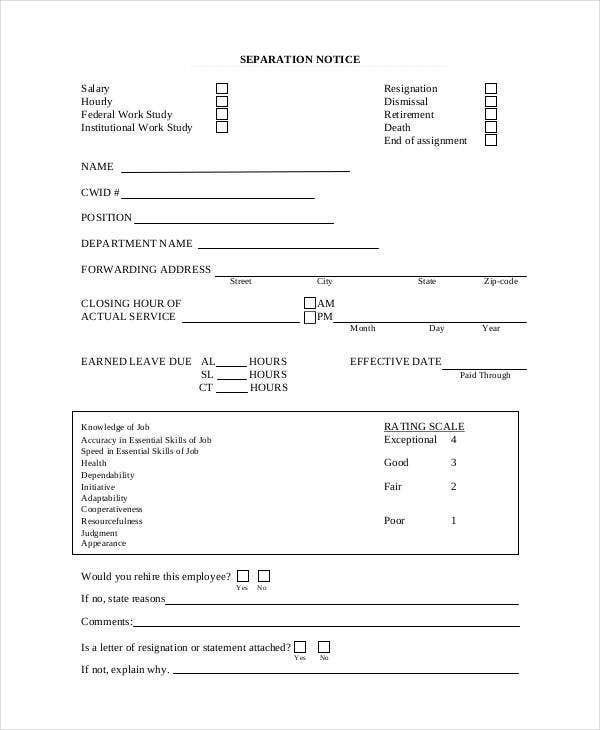 This template is crisp and reasonable and shall help the Supervisors to get the employee’s signature and statement of the reason for separation and other relevant information. You may also see Notice of Meeting Templates. 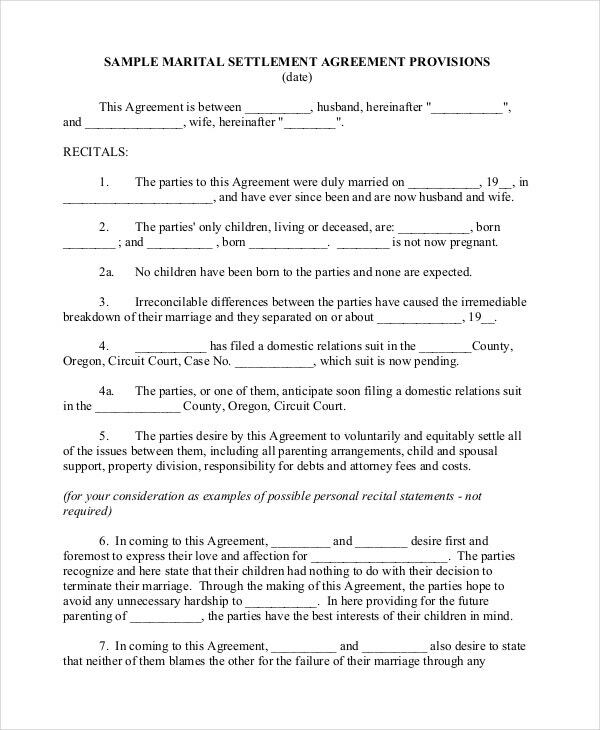 If you are planning for a divorce or separation, this marriage notice agreement will help you with a quick preparation of these negotiations and consultations. It helps you to draft the template tailored as per your situation. 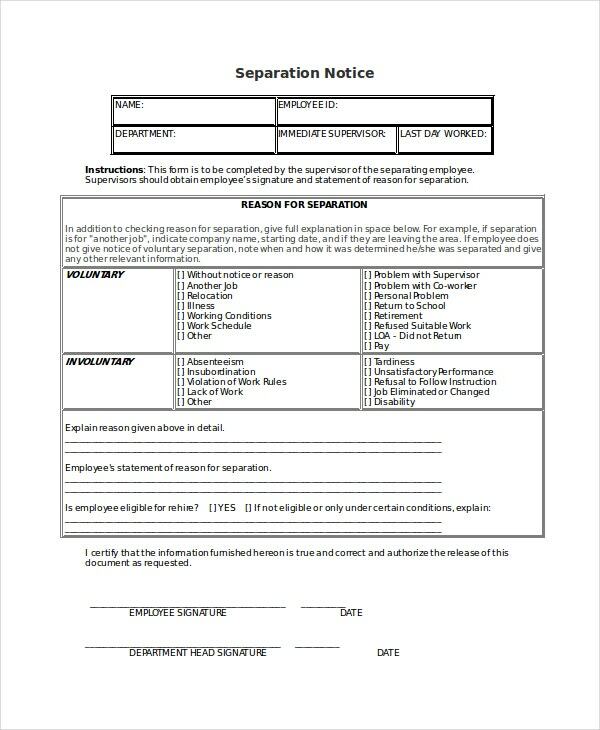 This Work Separation Notice Template will help any company to get started and identify the need for an employee to separate from the company in detail. It will help the supervisor to inform the boss the reason to leave the employment rather than submitting just a letter. The reason to use this template is to let the Dept. of Labor and Employment know regarding that employee’s termination so that it can be used as the purpose of the requirement for joblessness compensation. It gives a complete detail and reason for the separation of the worker from the work. 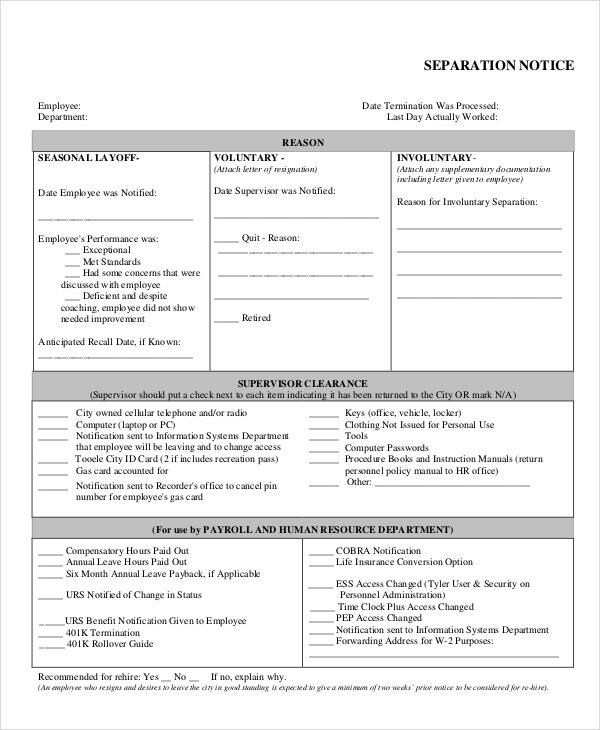 Job Separation Notice Template is significant for any company as it is used for business purposes where the companies get to know the reason of an employee for separation from work. It gives details such as reason of separation, fist and last day of working, address, remuneration, etc. > How to Write a Separation Notice? A separation letter is a notice which is given to the employee while they are leaving the job from the respective designation. 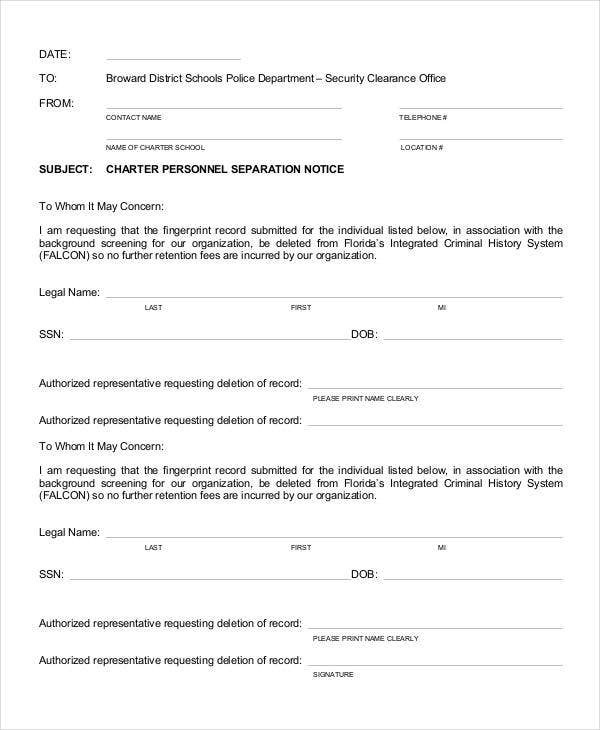 There are a lot of reasons for termination and the process you set about to both the parties at this instance can draft the notice. > What is the Purpose of a Separation Notice? 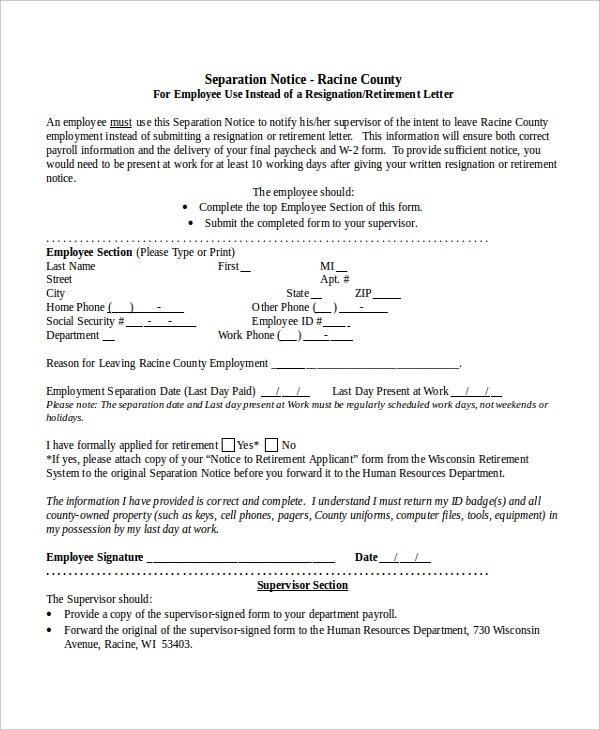 A letter of separation is a document that is issued to an employee when they leave the current position they are in. 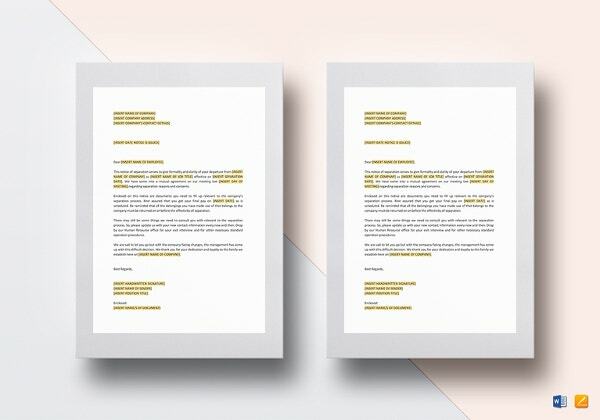 The purpose of this letter is that it means the employee and the company have mutually departed, their position has been terminated due to cost cutting measures, or in case if the employee has been retired. The letter of separation has some terms and conditions. The Notice Templates customarily thanks the worker for their sincerity, dedication and hard work put for the company. How to Write a Separation Notice? Separation notice is issued in case of employee termination, retirement or pursue of another position. In such cases a proper separation notice letter must be issued to the employee in order to avoid future conflicts and provide unemployment benefits to the recipient. 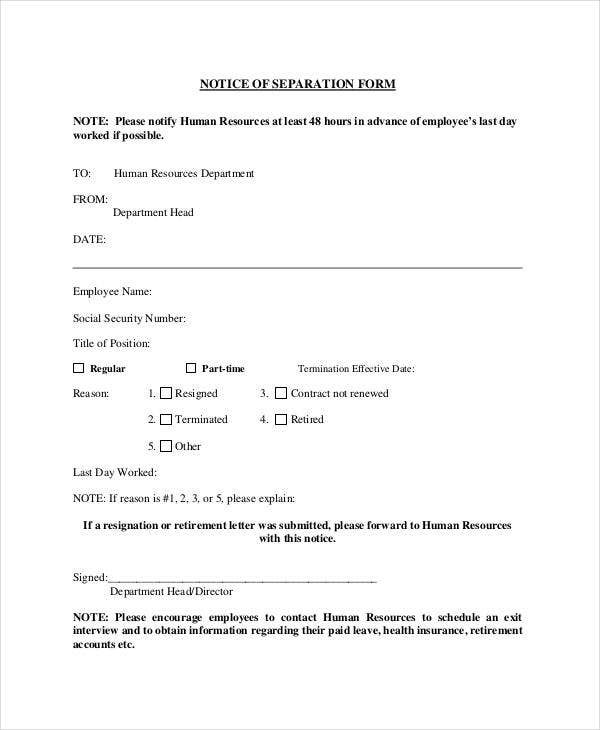 Employer can use separation notice templates and follow the below steps to write it: Employees personal details and relation with the organization Employee’s duration, roles and responsibility. The reason for the separation. Employee termination condition and justification. Info about severance pay and other pending dues. 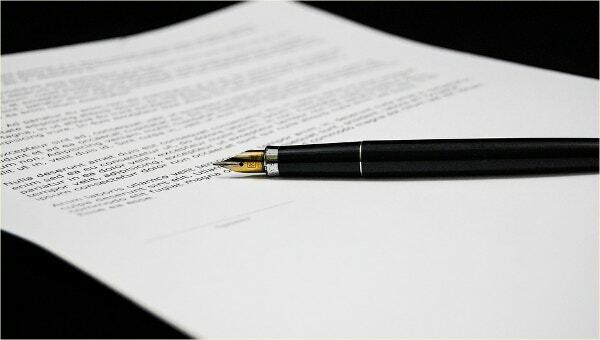 Business Letter Formats and polite language must be used while creating separation notice. What is the Meaning of Separation Letter? 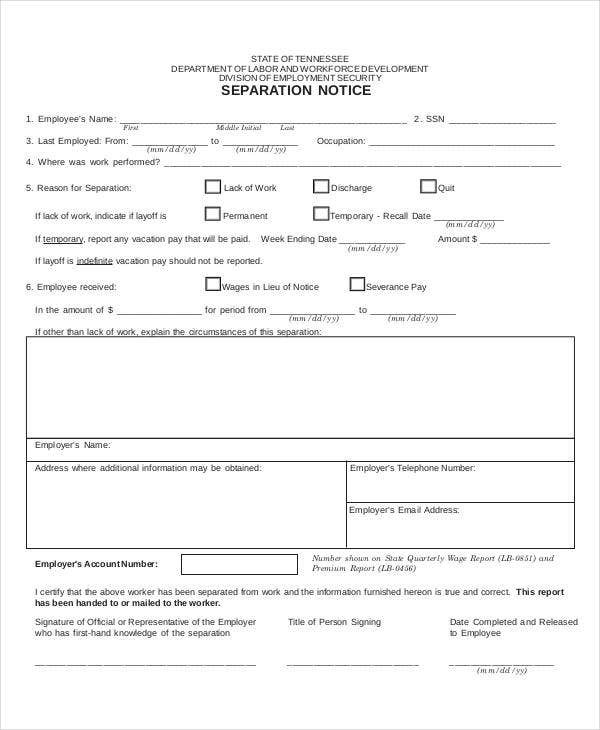 Separation letter is a document that outlines the termination of employment or services between an employer and employee. The separation reasons are being enlisted in order to justify the decision made against the employee or contractor. The separation letter is a formal way of convincing that employer require no more service from employee side. The possible reason of separation may include end of contractual period, layoff- as employer doesn’t have much work for his current workforce or voluntary resignation, which is a kind of resignation. 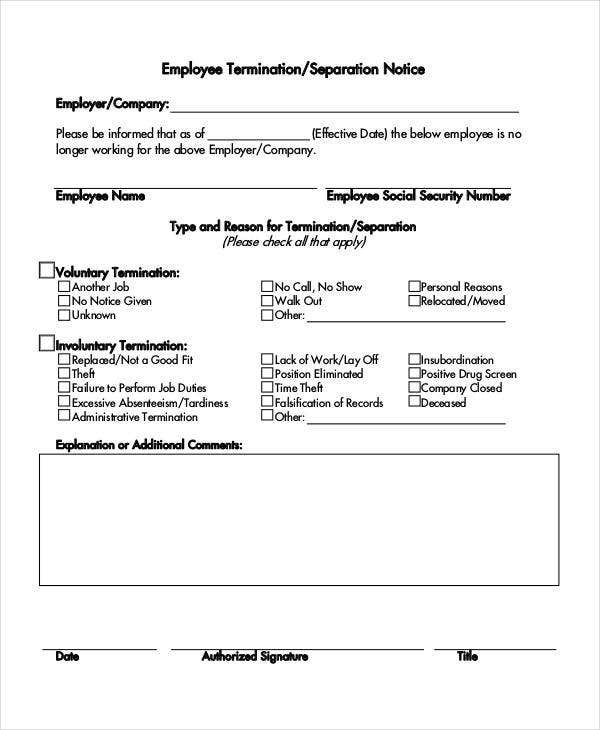 The employer can make use of Notice Templates in order to convey the termination politely with all necessary details. How to get a Separation Notice from a Job? Separation notice is essential as they make it easier for employees to receive unemployment benefits. 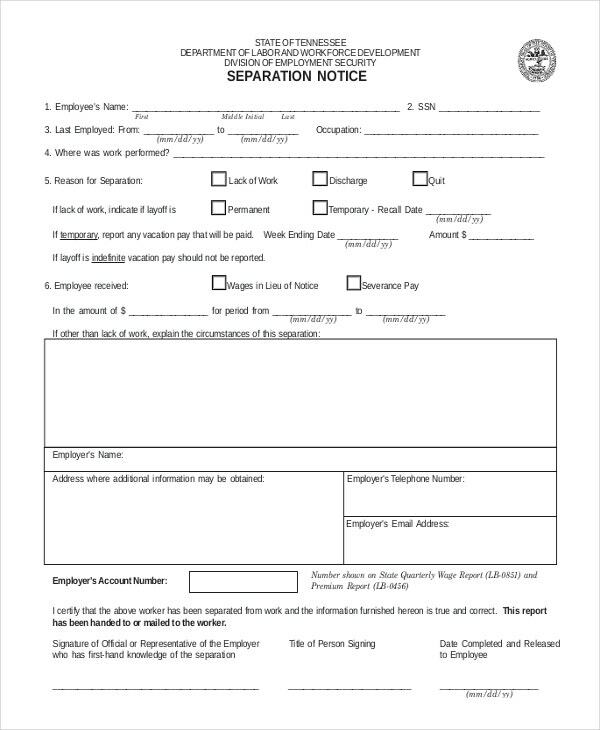 To get a separation notice from job follow the below steps: Easy way is to contact your former employer’s human resource department to ask for separation letter in case you haven’t received. 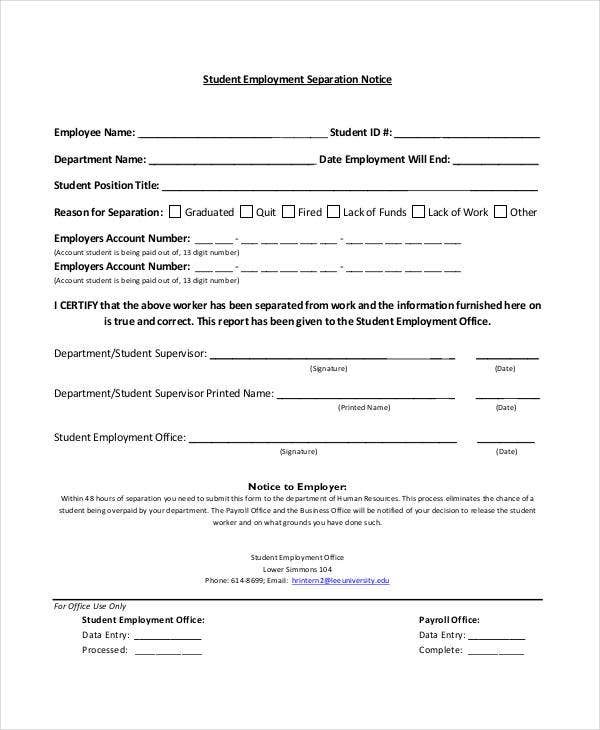 Another way is to take the print of Separation Notice Templates, fill it and bring it to your local unemployment office. They will suggest necessary action to receive your separation letter. Make sure that your employer has legal authority to provide separation notice. Compel them to issue the one while you are willing to leave the job. > How does the Separation Process Work? As we all know separation refers broadly to the process of terminating the employment, it involuntarily refers to discharge, layoff, plant closure, disability or death or voluntaries, such as resignation, job abandonment or retirement. If the employee is getting separated Free Notice Templates from the work, he/she is liable to pay back all the valuable things, loans or credits. If he fails to return all the assets of the company, the fee or fine may get deducted from his final paycheck. After returning all these things, an employee has to sign an agreement. 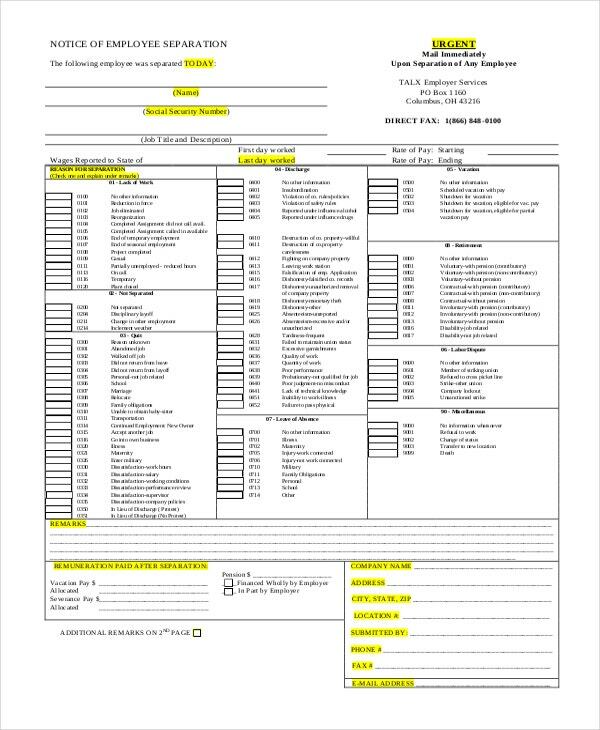 The above-mentioned Notice of Suspension Templates are planned to represent the details such as business liabilities, business activities and mechanisms, the relationship between the employer and employee and other important information. These templates are easily available and can be downloaded quickly. 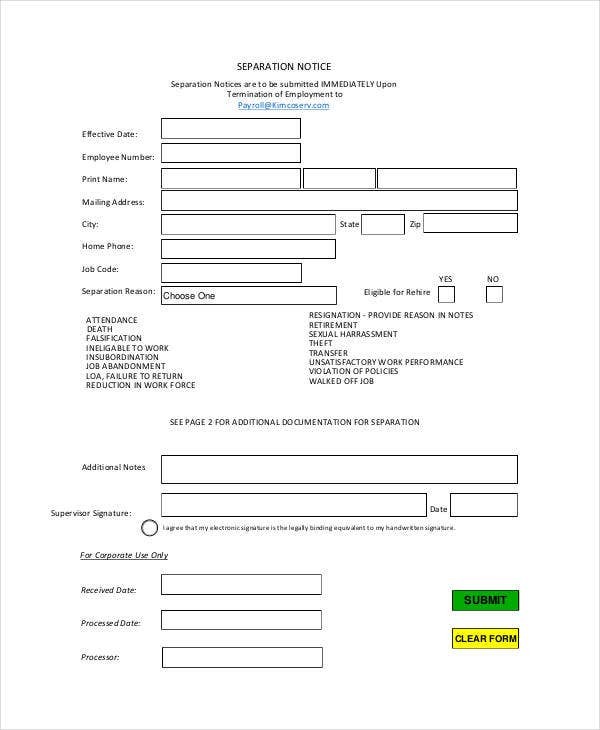 These are blank forms where the user can fill the suitable and relevant information.